The Global Issues Network (GIN) Conference empowers young people to develop sustainable solutions to address global problems and to implement their ideas with the support of the network. The key ideas are based on the book, High Noon- 20 Global Problems, 20 years to Solve Them by Jean Francois Rischard. Theme: "Changing Mindset, Encouraging Action"
On January 20 and 21, 2018, Concordia International School Shanghai will host the EARCOS annual Global Issues Network conference for high school students. GINAsia 2018 will feature the theme “A Place to Stand” and keynote speakers will include Kim Phuc, Ishmael Beah, Melati and Isabel Wisjen. Details are available at www.cissmun.org and schools are encouraged to register an intention to attend as spots will fill up quickly for this event. GINAsia 2018 will run at the same time as Concordia’s annual Model United Nations conference (CISSMUN) and the Concordia team is excited about combining the energy of these two powerful student groups to inspire and empower young changemakers from around the world. Questions about the conference can be directed to ginasia@concordiashanghai.org. 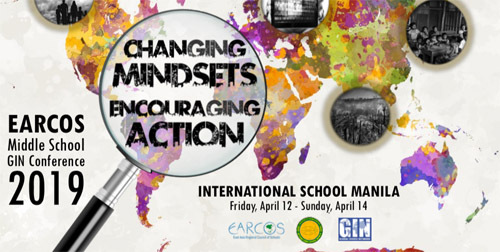 Canggu Community School in Bali will host this year’s EARCOS GIN conference for middle school students on March 2-4, 2018. GINBali is a dynamic conference with the theme of “Seeking Solutions”, which students will do through a variety of hands-on and engaging workshops. Keynote Speakers include Craig Leeson, Kevin Kumala, and Melati and Isabel Wisjen. Conference details are available at www.ginbali2018.com. Schools are encouraged to pre-register with their intention to attend by the end of October, as spots will fill quickly. Direct any questions about the conference to msgin@cssbali.com.